This section defines terms and concepts used in the scope of RadCalendar you have to get familiar with prior to continue reading this help. They can also be helpful when contacting our support service in order to describe your issue better. 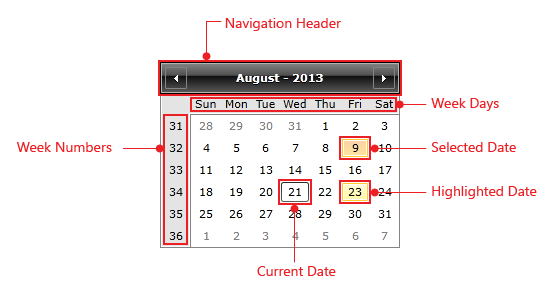 Navigation Header - the Header of RadCalendar. Includes the left and right navigation buttons and represents the current month. Week Days - the distribution of specific days in a month. Week Numbers - week numbers throughout the year. Current Date - indicates today's date. Selected Date - currently selected date or range of dates. Highlighted Date - currently highlighted date.